Providing a balanced diet for your pet bird is one of the most important parts of caring for your pet, to keep them healthy and happy. And it’s nearly impossible to achieve this using human food or scraps! 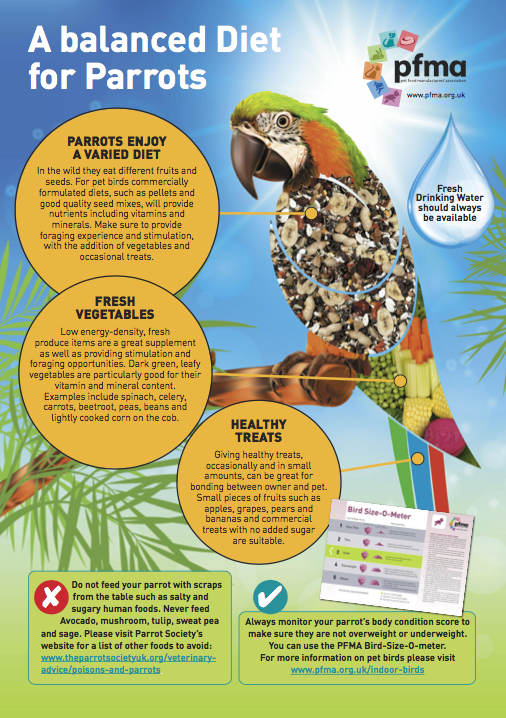 In this poster, we aim to show in a visual way, what proportion of a parrot’s diet should come from specialist bird foods and how much fresh produce can be added as supplements. Occasional healthy treats could also form a small part of their diet, and as a way of bonding with your pet. Don’t forget to put clean fresh water for them, and to keep an eye on their body condition and weight. To learn more about bird’s ideal body condition, please see the PFMA Bird Size-O-Meter. For more information about feeding pet birds, you can download our Indoor Birds factsheet.